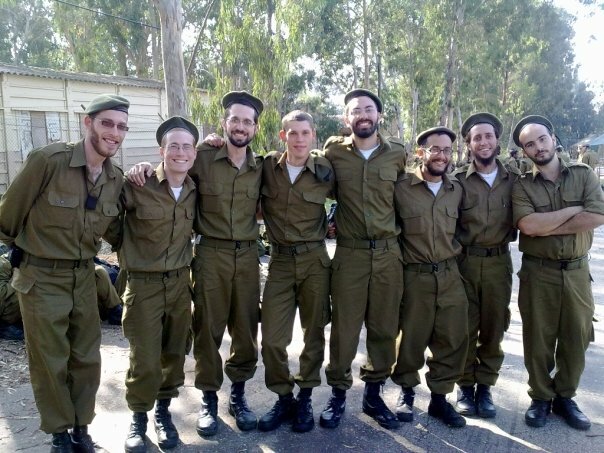 Rafi is the third from the right. Last day of basic training. During basic training in the Israeli Army, I experienced a lot. Not all of the experiences were good, and not all of them involved bathrooms with reverse plumbing. But some of them did. You may ask, “What, prithee, is reverse plumbing?” I can answer that. I didn’t major in philosophy for nothing. Reverse plumbing is when you’re in a situation like basic training in an army base that predates the British mandate. Back in British Premandate Time, plumbing was only just invented, you see, and they got everything right except the direction the water has to go in and the fact that the pipes have to actually not have gaping holes in them, being that if they do, the entire raisin d’frenchword of plumbing becomes defeated by a vote of everything to one, give or take one. So I was in “Tironut” for a month, which means basic training, most of which was fine except for the bathrooms and getting yelled at by people of the age requiring daily usage of Clearasil pads. In the end, I ended up knowing how to use and clean an M16 and guard an area, which mostly involves standing around scratching oneself in several areas while strapped with something of a bloated plumber belt packed with 5 magazines loaded with 29 bullets made in Oconomowoc, WI for Government Law Enforcement Use Only, making sure that no masochistic wackos from the highway across from me invaded the army training base. Oconomowoc is in fact a real city, named after Shlomo Hayim Oconomowoc, the first Zionist Native American who had the ingenious idea of shipping all his M16 magazines to Israel). After I guarded the Pre British Mandate Base with Reverse Plumbing, ingeniously named “Camp 80”, I was shipped to another army city called Tzrifin (literally “Bunks”) where I learned how to be a delivery boy. The course involved 7 days of classes, one of which included the issue of why one should even pay attention to complaints about service in the first place and how to tell which way was north on a map. Yup. I really was not sure how to answer these question. Later it was revealed to me that one should deal with complaints because of “snow balls” that can get bigger and bigger if you don’t deal with them. And north was up, assuming the letters were all in the right direction. So during the review session when the commander person asked why we should deal with complaints, I said, “Snow balls,” and she gave me a weird look. Guy (whose name is actually Amos): What do you think was the main failure with the Second Lebanon War? Guy: It was the fact that there were no delivery boys! They didn’t want to go up to the North because they were afraid of the rockets! So they just stayed home! (*Note: this is actually true.) That’s why we’re recruiting you, so you can be the new and improved Second Generation Delivery Boys all loaded and ready for the Third Lebanon War which will start whenever we start bombing Iran! You’ll bring the stuff to the fighters who will go into Lebanon and shoot terrorists and get condemned by the UN for excessive use of force! Without the delivery boys, the army is nothing! You are the key to the future of the nation of Israel! Without you, I’d be dead! So I am now part of that excessive use of force all the nations of the world keep talking about. Without delivery boys like me, there would be no force at all. So I got all inspired and did the best in the entire class of 16. I even did better than the Russians, and most of them were in the Russian army previously where if you didn’t do totally awesome they would force you to play Russian Roulette with a fully loaded handgun and make you go first. Then, today, I got to the base where I was actually going to do the delivering, only to discover that I wasn’t going to be a delivery boy at all. All I’m going to do is stack up humus up in a giant pile for the REAL delivery boys to ship off and deliver. So when the next war breaks out, and God knows it’ll be soon, just know that I was the guy who put humus in giant piles for the delivery boys to deliver to the guys who shoot the terrorists and get condemned by the UN. Without me, there’d be no condemnation by the UN, so just blame it on me. I take responsibility for it all. Unfortunately, the IDF doesn’t have much use for a humor writer. Google tells me that hummus isn’t spelled that way. Google says humus is the organic component of soil, formed by the decomposition of leaves and other plant material by soil microorganisms. That’s pretty much exactly what I was piling.